Throwing a birthday party for a teenager can be quite a challenge. Finding the perfect place to have a teen party can be one of the hardest parts! Teen birthday party ideas might be hard to come by, but thinking outside the box (and like a kid!) can help you find the perfect party place. By Lindsay Champion Teens are too young to go to parties at bars or clubs, but are too old to have a party at popular kids' party locations such as Chuck E. Cheese. If your teen is too cool for bowling alleys, consider more trendy locations. Whether you want to pay for all of your guests or have them pay for themselves ahead of time, there are fun locations in any city where teens can have a safe, fun birthday party. Six Flags is an amusement park owned by Warner Brothers, with multiple locations across the United States. If your teen is going to have a large party including many people, group rates are available with discounted tickets and inexpensive bus rates, so no one has to drive. Six Flags offers roller coasters, water rides, great food and carnival games, as well as live shows and nighttime events and concerts. Some Six Flags locations serve alcohol to patrons over 21, so be aware of that before leaving teens unattended in the park. You can purchase your tickets ahead of time or buy them at the park. Tickets are not refundable, so do not purchase them ahead of time unless you know everyone in your teen's party is committed to going. Dave and Buster's is an arcade-style restaurant and bar with dozens of locations in the United States. Dave and Buster's is open late and allows children and teens, along with an adult that is over 21. Although alcohol is served at Dave and Buster's locations, they do not serve without ID to any patrons. Dave and Buster's is widely considered to be a more sophisticated casino, with popular music playing, a fun food and dessert menu and hundreds of games. The games are played by swiping plastic cards into the machine that can be loaded with money. Best of all, Dave and Buster's offers a birthday special, where you get a discount if your teen subscribes to the Dave and Buster's mailing list. If lots of food is more your teen's game, reserve a table at an all-you-can-eat sushi restaurant. The more adventurous eaters can try anything on the menu for a fixed price, while the picky eaters can stick to simpler fare such as chicken teriyaki and dumplings. 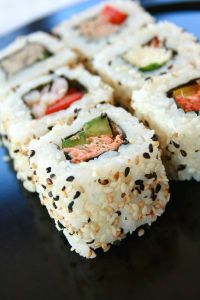 All-you-can-eat sushi is an affordable way to have a party, as every attendee can eat as much as he wants for a low price. The one catch is that most all-you-can-eat sushi restaurants require that all the food is eaten, or else you are charged an extra fee. Make sure that your teen's party knows this before they order the eel roll and decide they don't like it. You can find your closest all-you-can-eat sushi restaurant online (see Resources).